Air Playit is powerful &free video audio steaming software for iPhone iPad which works perfectly in streaming & downloading video audio to iPhone iPad via WiFi, 3G, 4G networks. Built in 320 video audio codecs, Air Playit can support streaming and live converting almost all movies and music. You know there are two problems with playing video on iPad: space, and file formats. Wouldn't it be sweeter if we can enjoy video audio music on iPad immediately by eliminating space and file formats troubles? Air Playit – the iPad app for streaming video audio music, will tell you. In order to watch the DviX Xvid video on iPad iPhone, most people choose the conventional and time-consuming practice of conversion and sync, in fact, it will be much less complicated if you choose streaming DivX Xvid video to iPad iPhone wirelessly with Air Playit. If your job makes you on the go, you can also make your videos on the go. Streaming HTPC video to your iPad iPhone can make it possible for you to watch HTPC videos on iPad iPhone anywhere even when you are often away from home on business trips. Air Playit is a free iPhone iPad app that can help you streaming almost all videos to TV via iPhone iPad. Thus, you can watch any videos on your widescreen home TV with your family members. Air Playit offers you a different way for streaming RM RMVB videos to iPad iPhone directly from your computer hard disk without conversion and sync, if you do not want to waste energy and money on converting the RM RMVB video on iPad iPhone. iPhone iPad only support H.264 and MPEG-4 video formats. How to play movies with incompatible formats on iDevice, such as MKV, FLV, M2TS, etc? Now you can remotely watch these movies on iDevice with Air Playit which is capable of free streaming movie to iPhone iPad via WiFi, 3G, 4G network. There are so many iPod touch users worldwide mainly because it is thin, light, smart and convenient to carry. Do you have an iPod touch? Air Playit can help you enjoy movies and music by easily streaming video audio to iPod without the need of waiting for conversion. This guide will show you a simple way of streaming video and audio to iPhone 4 from your PC or Mac. As a free video streaming app, Air Playit is capable of streaming video and audio to iPhone 4, so that you can enjoy movie and music on your iphone 4 directly without converting format beforehand. Just imagine, wherever you are, if you can connect to 3G/4G network, you're able to remote stream media to iPhone iPad from PC/Mac hard drive. No syncing, no tedious format converting and no space requiring. 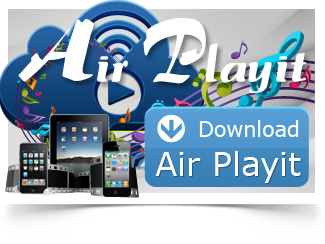 Yes, we're talking about Air Playit. If you are an iPhone/iPad user, you surely know the sync operation is so complicated and annoying, but is there any way to avoid such trouble? Yes, Air Playit, free video streaming software, can help you stream any video to iPhone/iPad from your PC so that you can watch videos without waiting.